This is a back to back ‘Klaxons cover special’ of Klaxons and their version of Justin Timberlake’s ‘My Love’ as well two other artists and their versions of Klaxon’s ‘Golden Skans’. Unfortunately, there were no covers of Justin Timberlake doing Klaxon’s ‘Golden Skans’, otherwise that would’ve been cool, and not to mention slightly amusing. 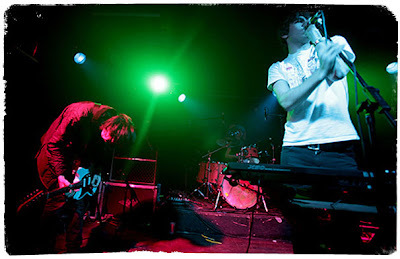 Klaxons singing ‘My Love’: is there anything wrong with that picture? No, except that ‘My Love’ is probably the most over-rated song in the history of mankind albeit a decent one. I love covers, I was kind of hoping that this particular version of ‘My Love’ would take some risks and twists and turns and transform the song from dislikable to worshippable. Regrettably, I could hardly tell the difference; you’re better of liking the original version. Between Kaiser Chief’s and Mark Ronson’s rendition of Klaxon’s ‘Golden Skans’, I found Mark Ronson’s version more agreeable due to the new dimension that’s been given to it thus a new genre altogether; a cover that could persuade people who initially despised the original version to fall in love with its counterpart.